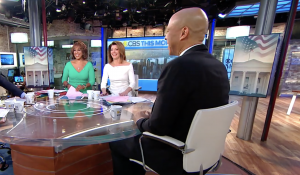 "CBS This Morning" alerted viewers to the personal friendship between host Gayle King and Sen. Cory Booker (D., N.J.) before their interview Monday, after previously failing to do so in two appearances by Booker last year. Co-host Bianna Golodrgya noted at the outset that King, who is also close with the Obamas and is best friends with Oprah Winfrey, was a good friend and supporter of Booker's. King said, "I'd like to still [we're] still friends," and Booker laughed and said he hoped Golodryga wasn't speaking in the past tense. However, Booker was a guest on "CBS This Morning" on Jan. 17, 2018, and Jan. 26, 2018, with King being one of the CBS interviewers asking him questions both times, and the show did not disclose their relationship either time. Booker, who announced he was running for president last week, and King have attended events together, but both denied they were ever romantically involved. Booker has never married and would be only the third U.S. president to be unmarried in office if he won in 2020. Viewers were alerted to the friendship between them in 2012, however, in an unusual appearance. He appeared on the program that year when he was still the mayor of Newark, and the two alluded to their friendship at first without specifically talking about it. At one point, King noted Booker's social media prowess that had made him one of the country's most famous mayors, although she quipped, "I personally think you Twitter too much." However, then-host Charlie Rose brought up the two's relationship and asked Booker about it. King smiled and asked Booker for "full disclosure," saying "let's give them something to talk about." Booker called King "one of the seminal forces in my life of friendship" and said that the night before she began her tenure on "CBS This Morning," they were up until midnight hanging out. Rose, who would later be fired over multiple allegations of sexual harassment, interrupted and said, "What does that mean, hanging out?" Booker laughed, and King said, "It's not hooking up, Charlie. No boinking has occurred. We're really good friends."